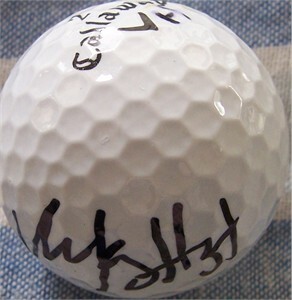 Callaway Hex Black golf ball practice used by LPGA star Vicky Hurst during the 2012 Kia Classic tournament, autographed in black marker. Marked with her initials VH (using the Callaway logo as the V). With certificate of authenticity from AutographsForSale.com. ONLY ONE AVAILABLE FOR SALE.